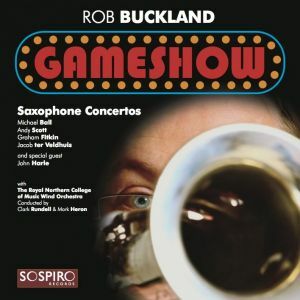 On sale now: Gameshow – the stunning new album from Rob Buckland featuring saxophone concertos by contemporary composers Michael Ball, Graham Fitkin, Jacob ter Veldhuis and Andy Scott. The long-awaited album of saxophone concertos commissioned by and for Royal Northern College Professor and founder member of the Apollo Quartet Rob Buckland is a labour of love, and includes pieces that he has played over the past few years with the College's Wind Orchestra. The young musicians clearly idolise their teacher and have pulled out all the stops with some technically difficult pieces to produce a very listenable CD. Buckland's mastery of the instrument and use of modern techniques push the sax into areas unimaginable twenty years ago. I particularly enjoyed the first piece by Michael Ball and Dark Rain by Andy Scott which features John Harle, the other towering figure on the UK Saxophone scene. Scott has a lyrical touch which I felt gives an optimistic end to a piece inspired by a visit to Hiroshima. Gameshow by Graham Fitkin and Tallahatchie Concerto by popular Dutch composer Jacob ter Veldhuis maintain the high standard of composition and playing.